By Ganga Charan Das Gupta, M.A. To be in Love with the Mother is the most incredible time in my life. I wish for Ma to cloak you in Ma’s love all the days of your life. Dive into Ma’s black Ganga waters and feel the smooth cool silkiness of Ma’s shakti. Sit in the stillness of Ma’s silence and feel Ma’s presence in your 720 million nadis, coarsing through your being. Feel Ma’s breath upon your brow, as Ma bends to gently kiss you good night. 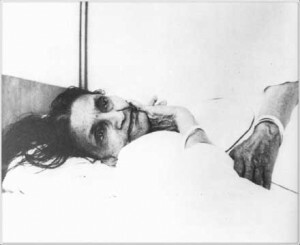 I sleep in the arms of the Mother, I live only through Ma’s grace. I want only to sit at Ma’s lotus feet in the cremation grounds all the days of my life. Ma is my all , my everything. May you also be so blessed. Namaste Trishula. Mother of Grace! May we ever keep ourselves open to Thee for the fulfillment of Thy Will in us and through us. May we learn and realize that in Thy Love lie hidden all the secrets of life; the answers to all riddles. May our love for Thee be unconditional, unreserved and entire so that we may make a complete offering to Thee of all that we consider belongs to us. Mother! Thy Grace flows in abundance perennially; make us worthy of it by teaching us to Love and aspire. Towards Attaining Identity with Ma Dissolving the Ego. 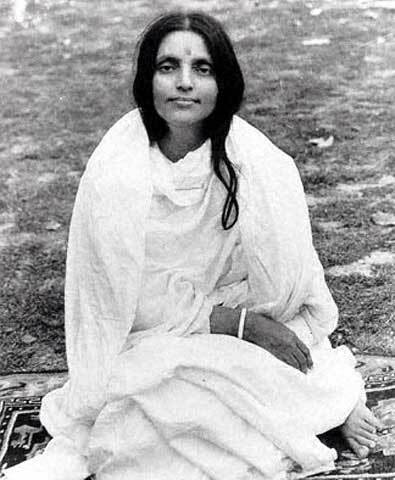 At a Matri-satsanga at Vrindaban during the Samyam Mahavrata in 1969, a question put to Ma was, “How can the knots of the ego be undone ?“ And Ma had replied, “By carrying out the Guru’s instructions without arguing. That is not the place to use one’s knowledge and intelligence. Here knowledge and intelligence will not do. They are useful up to a stage. They provide you with information. The Shastras have been read, studied and committed to memory. One has acquired knowledge along a particular range. This is but the knowledge of ignorance.” Note 1.
i.e. destroy all the books you have and direct your life and heart, towards the beloved) and: (Search, search, search. See within yourself, for He is not outside of you). That is why Ma concludes, “Follow the guru’s instructions without arguing. As long as the reason of the individual is in power, how can the knots be undone?” Why not? Because it is through arguments that reason operates and arguments are a flow of words by which views are expressed, accepted or rejected, since all those words come from the mind, they keep one there. To dissolve the ego, one has to go beyond the mind. And ‘as Sri Nisargadatta Maharaj, the famous saint-author of the well known work ‘I am that’, puts it, “To go beyond the mind, you must be silent and quiet. Peace and silence, silence and peace — this is the way beyond. 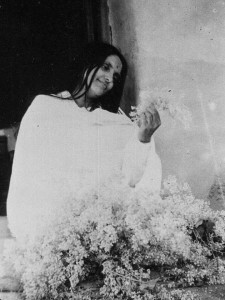 Stop asking questions,” In this connection, Ma says, “What does entering into one’s true being (svarupa) signify? To realize what is: that He, the self-effulgent one is all-pervading, present in all shapes, states of mind and modes of existence. There, speech or words have no place. For, can essential form (svarupa) or formlessness (arupa) be described in any language? He and He alone is.” Note 2. So it is hundred percent perfect, loving obedience, born of total silent surrender at the lotus feet of Sri Sadgurudeva (Who is the Lord Himself in human form) with absolute unquestioning faith in his words that can undo the knots of the ego. It would be relevant to quote here a well-known couplet of Goswami Tulsidasji Maharaj from his Ramacharita Manas. The couplet is (Accepting the words of one’s mother, father, God and guru as auspicious, one should act implicitly in accordance with them without any Vichar i. e. deliberation). The Right Drishti (Perception) The correct bhava(inner feeling), which has to be cultivated through abhyasa (constant practice) to proceed successfully to the goal of self knowledge was clearly enunciated by Ma at a Main ­Satsanga held in Dec. 1947. The English version of suitable extracts from what was then recorded in Hindi as Ma’s words is given below: Ma said, “So long as you keep your mind on worldly things there will be no end to your desire for worldly objectives. When the mind will receive real food, then only will you get peace. When you will get the highest treasure of God-attainment, then only will you secure complete peace.” “Only one Bhagavan alone is everywhere, only He, only He, only He. The only duty of man is to give pure food to the mind.., where is our home? Our true home is that of Bhagavan. Who is ours? only Bhagavan is ours. “Always keep this bhava in your mind that whatever is happening is due to God’s will. From now onwards, I shall perform only good actions. Take such a firm decision. This is one thing. “From the point of view of Reality, however, there is nothing good or bad. But as long as you have deha-atma buddhi (identification with the body in ignorance), till then you should never indulge in any wrong action. Thinking otherwise is only drishti-bhram (deluded perception). Bad actions result in suffering. One’s drishti should ever be clean. If you can understand that all this is the Lord’s play, then nothing at all is bad. Question: How to effect a change in our outlook? Ma: “How to effect the change? By thinking of God. In a bad man and in the sadhu, Bhagavan alone is playing in all. The wrong drishti is wrong. Correct the drishti. The bad is also His form. “Where the drishti is auspicious (right), there nothing at allis bad. See all forms with Bhagavat bhava. Where the bhava is of duality, wrong drishti is there. Wrong drishti results in suffering. As the drishti, so the srishti (creation).” No birth no death The unreal is illusory – a mere passing appearance like a dream or a snake in the rope. It does not in fact, exist and therefore, for the unreal, there is neither birth nor death. As for the real, there can be no question of birth, as being eternal, it has a permanent existence. So there is neither birth nor death.” Note 3. Ma’s teachings couched in Bhaiji’s language forms the authoritative contents of the widely-known publication ‘Sad-Vani’. At one place, it states, “This world may also be likened to a vast ocean. How many myriads of beings are born and die every moment, and where they go when disappearing from our sight is beyond the grasp of human understanding. This constant flux in nature illustrates the fact that, in reality, birth and death do not exist. There is only One Supreme Being that manifests itself in countless forms in numberless modes of life.” Note 4. A similar thought is found in the commentary on Verse 12, Chapter 2, of Shree Bhagavad Gita, by one of the extraordinarily blessed saints Sri Jnanadevaji Maharaj.” The English version of the Verse is: “It is, indeed, not the case that I, ever before, was not, nor thou, nor these lords of men; neither is it the case that hereafter, all of us are not going to be,” And the commentary reads: Commentary “Arjun, verily I say to you further: It is the merest delusion to feel certain that you yourself, myself as well as all the kings whom you see assembled here will live eternally, or would as surely be dissolved into nothingness; these are utter unrealities. The generative creation and decay are appearances caused by Maya, Brahman (the supreme) assuredly in itself being indestructible and immortal. “Just tell me whether anything really is born when the wind causes ripples on water. Consider further if any real thing is destroyed when the gust of wind gets calm and the ripples disappear into the original stillness of water.” Note 5. Like the proverbial snake and rope is the analogy of the ghost and the post. So Swami Cbinmayanandaji says in his commentary on this verse “Having had the vision of the post, the post-wise one will have to decry the delusory agitation of the ghost-seeing fool. Delved in consciousness, reveling in consciousness, living in consciousness, the great master of every heart (Gaudapada) — reigning the Realm of All — in his vision has no world of objects separate from himself. If, however, one sees plurality and seeks after a cause for it, he shall be seeking (the cause) for the footprints of the birds in the sky.’… Plurality could rise only from some cause; but nothing exists other than the highest truth; Therefore, nothing has ever been born.” Ma is All and All is Ma The universe is Ma’s Self-revelation, and everyone, in reality, is Ma’s very image, both revealed and unrevealed. 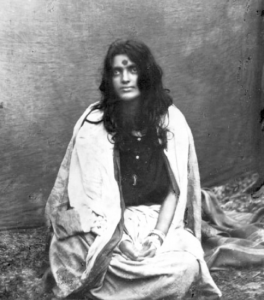 Although, according to Her own words, as mentioned above, Ma Herself is the Supreme Reality, she has often preferred the term Bhagavan to refer to that reality. Others have called it God, some, Self, while still others just He. Note 6. That this Reality is all, and all is that Reality has been brilliantly set forth with amazing wideness including some delightful wit in the following words of Sri Yogi Krishnaprem, the highly talented Englishman who had turned an orthodox Vaishnava a devoted disciple of the well-known lady saint Yashoda Ma: “I tell you, all is phantom unless He is seen, who is the only real. See Him and all is His garment; see Him not and all is the merest phantom, “What is Maya, you ask?“ To see anything whatsoever apart from Him, that is the illusion the source of sorrow. There are no ‘emanations’, no ‘creations’ – no things at all apart from Him. All these are so many words which describe deluded ways of seeing. See them and you do not see Him. See Him and you see that all is Him — Nothing has vanished, nothing is lost, nothing is rejected: seeing Him you see that all is Him and He is all.” “What we call the beauty of the sky, the great spaces of air, the life-giving flow of water, the bright power of fire — all these are Him. See them as separate and you find yourself in the arid desert of scientific nonsense. See Him and they are seen to be ever living gods who form His limbs, eternal as He is eternal.” Note 7. Thus Ma and Ma alone — the Uncreated — is all the time the sole eternal entity. She is our Real Self — the One Atma — of everyone, ever-free, immutable and beyond mental realm. The scriptures call it Sat-Chit-Ananda (Existence-Know­ledge-Bliss). In ignorance of this truth about what we are really, we identify ourselves with the unreal (Changing) waking state of consciousness as body-mind entity, while ignoring the factual significance of the other two states of dream and deep sleep. But attachment to any aspect of the unreal —a mere passing appearance — is naturally a womb of sorrow, pain and misery, because of its being impermanent. Against this, the ever-present —the eternal, which can never vanish — is peace, bliss and wisdom. A clear mental discrimination between real and unreal results in vairagya (renunciation), i. e. absence of any involved interest in anything unreal. 1. “In order to advance towards Self-realization, it is absolutely necessary for an aspirant to yearn constantly for his sublime goal. He should practise sadhana regularly, whether he feels in a mood for it or not.” Note 8. 2. “To criticize people or to feel hostile towards anyone harms oneself and puts obstacles into one’s path to the Supreme. If someone does something bad, you should feel nothing but affection & benevolence towards him or her. Think, ‘Lord, this is also one of Thy manifestations. The more kindly and friendly you can feel and behave towards everybody, the more will the way to the One, who is goodness itself, open out.” Note 10. 3. “Take care not to be contented at any stage. Some aspirants have visions, others realizations. Or someone experiences bliss, great happiness and thinks he has himself become God. On the spiritual path, before true realization supervenes, one may get caught in supernatural powers (vibhutis). To become entangled in this kind of thing constitutes an obstacle.” Note 11. 6. “An aspirant should not indulge in useless conversation or gossip, but speak only when it is really necessary, which means that he must be a man of few words.” Note 9. 7. “Try and try again to reach the goal you have set before yourself. So long as realization does not come, you must never relax you efforts. Let this be your firm resolve.” Note 12. 4. “The positive proof that the aspirant is centred in God is that he ceases to hate any person or object, and that good qualities such as love, forgiveness, patience, forbearance go on increasing in him.” Note 13. 5. “When this change takes place in an aspirant, he will come to see that the One Brahman pervades each and every form, all sects, creeds and religions, just as the same person is addressed by his son as father, by his nephew as uncle, by his wife as husband and by his parents as son.” Note 14. Love, the crucial factor. In conclusion, I would like to emphasize that in the quest for Self-knowledge, Love is the crucial factor. Says Ma, “Whether it pleases you or not, you will have to make the Eternal your constant companion, just like a remedy that has got to be taken. Without loving God, you will not get anywhere. Remember this at all times.” Note 15. Again “If you are able to love God really — This is the consumation of all love”. Note 16. We think we are very clever when our mind actively makes incissive appraisal of people, praising some and condemning others critically. We forget that in all such haughty discrimination, the operator is the ego and the hidden purpose is indirect self-praise. Love resides in a motherly heart. It does not discriminate, it accepts unconditionally. As Bhaiji puts it, “Love never claims, it ever gives; Love ever suffers, it never resents and never revenges itself.” Note 17. It is such love which leads to union with the One in all forms. Swami Vivekananda, ever the loving idol of all India, says in his unique style, “Let nothing stand between God and your love for Him. Love Him, love him, love him, and let the world say what it will … Love is higher than works, than yoga, than knowledge.” Note 18. And he insists: “Never ask that foolish question: What good will our love of god do the world? Let the world go. Love, and ask nothing; love and look for nothing further. Love and forget all the ‘isms.’ Drink the cup of love and become mad. Say ‘Thine, 0 Thine for ever 0 Lord’ and plunge in forgetting all else. The very essence of God’s love … The highest expression of love is unification.” Note 19. And so love for our Divine Mother is the way to identification with Her, whose attributes in the peerless words, again of Swamiji, are: “All-merciful, all-powerful, Omnipresent.” She can show Herself to us in any form at any moment. A bit of mother, a drop was Krishna, another was Buddha; another was Christ. The worship of even one spark of mother in our earthly mother leads to greatness. Worship Her if you want love and wisdom.” Note 20.